WASHINGTON, Oct. 15, 2010 — Marines at Camp Pendle­ton, Calif., got a glimpse last week into what’s like­ly to be the train­ing envi­ron­ment of the future: one that injects live actors, ani­ma­tron­ics, pro­ject­ed avatars and oth­er sen­so­ry enhance­ments to repli­cate the sights, sounds, smells and stress­es of com­bat — and demands the same razor-sharp deci­sion-mak­ing process­es and respons­es. Marines pre­pare to enter a mock Afghan vil­lage set­up at the Infantry Immer­sion Train­er at Camp Pendle­ton, Calif. The exer­cise was part of a U.S. Joint Forces Com­mand joint capa­bil­i­ty tech­nol­o­gy demon­stra­tion that close­ly sim­u­lat­ed bat­tle­field con­di­tions. The Marines, many recent­ly returned from com­bat deploy­ments, test­ed out some of the vir­tu­al real­i­ty-based train­ing con­cepts U.S. Joint Forces Com­mand is explor­ing to bet­ter pre­pare ground troops for com­plex oper­at­ing envi­ron­ments, Jay Reist, who’s head­ing up the effort, told reporters yes­ter­day. Reist is pro­gram man­ag­er for what Joint Forces Com­mand calls its “future immer­sive train­ing envi­ron­ment joint capa­bil­i­ty tech­nol­o­gy demon­stra­tion.” The two-year project, near­ing its com­ple­tion, is part of a broad Defense Depart­ment-wide cam­paign to make ground-based sim­u­la­tion as real­is­tic as pos­si­ble. The demon­stra­tion com­bines emer­gent tech­nolo­gies in a real­is­tic urban train­ing envi­ron­ment, based on real deploy­ment expe­ri­ences. Its goal, Reist said, is to improve pre-deploy­ment train­ing for the most vul­ner­a­ble warfight­ers: dis­mount­ed troops oper­at­ing at the small-unit lev­el. “We’re real­ly focused at the small unit, infantry squad lev­el and pro­vid­ing them capa­bil­i­ties using emerg­ing tech­nol­o­gy to cre­ate a learn­ing expe­ri­ence for them to be bet­ter pre­pared for the com­plex envi­ron­ments that they go into,” he said. The project aims to hone their deci­sion-mak­ing process­es so they’re bet­ter poised to react to stress­ful, tac­ti­cal­ly chal­leng­ing sit­u­a­tions, he said. Marines test­ed the con­cept over the past few months at Camp Pendleton’s infantry immer­sion train­er, wrap­ping it up dur­ing an inten­sive four-day event last week. Con­front­ed with five rig­or­ous sce­nar­ios in a three-dimen­sion­al mock Afghan vil­lage inten­tion­al­ly designed to induce stress and a sense of “being there,” the Marines inter­act­ed with friend­ly, as well as hos­tile, vil­lagers as they con­duct­ed their mis­sions. Through­out the sce­nar­ios, they had to make the same some­times split-sec­ond, life-and-death deci­sions required dur­ing deploy­ments: What feels right and what doesn’t? And what’s the best way to respond when things don’t feel right? While the Marines nego­ti­at­ed the sce­nar­ios mul­ti­ple times, Reist and his team mon­i­tored their every move­ment through sen­sors attached to their hel­mets, weapons and knees, and video and audio recorders strate­gi­cal­ly placed through­out the venue. 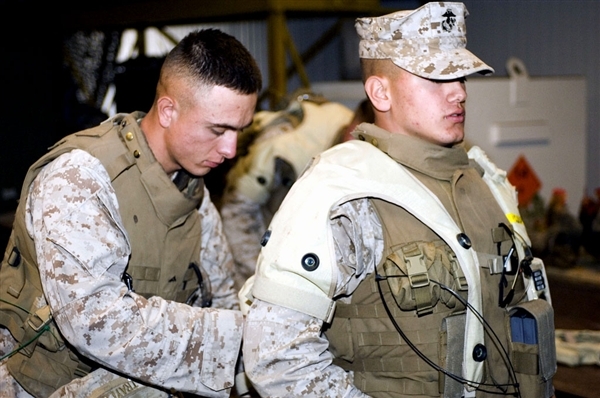 The team also mon­i­tored the Marines’ heart rates and oth­er vital signs to assess their stress lev­els dur­ing the exer­cise. “Through the tech­nol­o­gy we have emplaced in that venue, we can track every sin­gle step they took,” Reist said. Inte­grat­ed with real-time audio and cam­era feeds that cap­ture every action tak­en and word spo­ken, “we have ground truth on every­thing that took place with­in that sce­nario, in that venue, and that learn­ing envi­ron­ment,” he said. After­ward, the eval­u­a­tors joined unit lead­ers in con­duct­ing debrief­in­gs and exten­sive after-action reviews of what went right, what didn’t, and what areas need­ed improve­ment. The result, Reist said, was that par­tic­i­pants per­formed bet­ter each time they ran through the sce­nar­ios. To sci­en­tif­i­cal­ly ver­i­fy that, the eval­u­a­tors gave the Marines two sit­u­a­tion­al judg­ment tests devel­oped by Joint Forces Command’s sub­ject-mat­ter and human-per­for­mance experts. One was admin­is­tered before the Marines ran through the sce­nar­ios, and the oth­er after. “You can pret­ty much, based on the data we cap­tured, get a good diag­nos­tic of the learn­ing expe­ri­ence that they went through,” Reist said. He empha­sized the impor­tance of con­sis­tent­ly thread­ing key themes through­out mis­sion prepa­ra­tion, exe­cu­tion and review. That helps get teams and small-unit lead­ers to the point where “they are real­ly bet­ter at deci­sion-mak­ing and mak­ing sense of the envi­ron­ment,” he said. Last week’s exer­cise built on progress made since Marines at Camp Leje­une, N.C., and sol­diers at Fort Ben­ning, Ga., test­ed the first spi­ral of the demon­stra­tion project in March and April. That exer­cise empha­sized vir­tu­al train­ing, with real­is­tic dig­i­tal towns and play­ers repli­cat­ing warfight­er expe­ri­ences in both Afghanistan and Iraq. The Camp Pendle­ton exer­cise, spi­ral two of the demon­stra­tion project, took that train­ing expe­ri­ence to the next lev­el, Reist explained. With an empha­sis on live train­ing, it merged vir­tu­al and live capa­bil­i­ties to present par­tic­i­pants with both phys­i­cal and men­tal chal­lenges. While bet­ter prepar­ing warfight­ers to oper­ate in demand­ing and high­ly stress­ful envi­ron­ments, Reist cit­ed anoth­er, ini­tial­ly unin­tend­ed, ben­e­fit of immer­sive train­ing: pre­vent­ing post-trau­mat­ic stress. “The more you can ramp up the inten­si­ty of train­ing pri­or to trau­mat­ic expe­ri­ences in com­bat, the more you are going to mit­i­gate that post trau­mat­ic stress on the oth­er end,” he said. Recent­ly returned com­bat troops also appear to ben­e­fit from re-immers­ing them­selves in a high­ly charged envi­ron­ment sim­i­lar to what they left behind, he said. Italien — Neue amphibische Großkampfschiffe für italienische Marine?